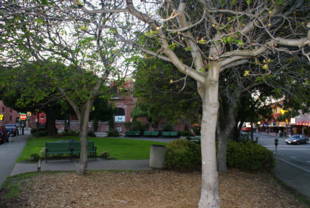 A small open space in the Marina District/North Beach, Joseph Conrad Square provides benches to rest and relax after exploring North Beach and the Marina. It's right in the middle of the Columbus, Beach and Leavenworth intersection. There are trees to enjoy and after you're done taking a break, you can head over to Aquatic Park of the Golden Gate National Recreation Area! 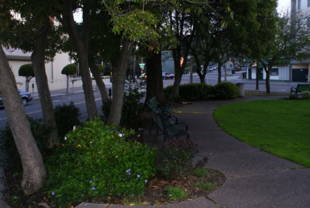 Joseph Conrad Square is owned by the San Francisco Recreation and Park Department. 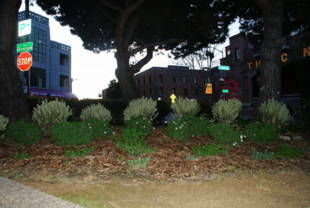 Powell-Hyde Cable Car: Beach and Hyde Streets, walk one block east to Columbus. 30-Stockton or 47-Van Ness: North Point and Hyde. From there, you can either walk east on North Point to Columbus/Leavenworth (then north to the park), or walk north on Hyde to Beach, then east to Columbus.